"Vulnerability Remediation:Common Pitfalls & Best Practices to Succeed"
A lot of vulnerability remediation pitfalls can be avoided by investing in the right Vulnerability Risk Management technology. This means implementing a solution that effectively automates as many processes as possible. Vulnerability Risk Management is often under-sourced and under-tooled, and yet stands at the epicenter of protecting the organization from a breach. 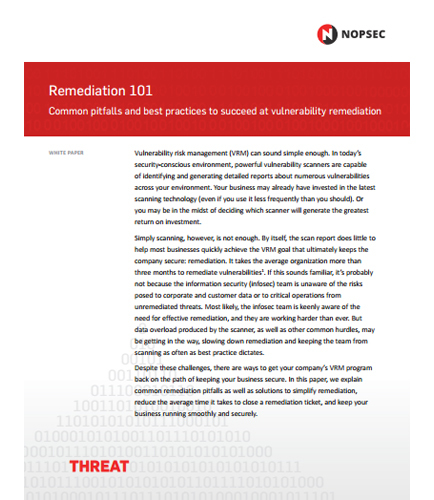 If you’re responsible for any part of your company’s Vulnerability Risk Management (VRM) program, this white paper is indispensable!